FILE - Members of the Ethiopian army on the streets of Addis Ababa. Despite a lull after hostilities earlier this week, tensions remain high across the militarized border between Ethiopia and Eritrea. 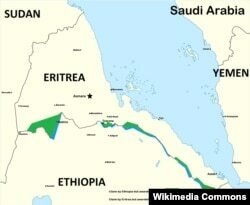 Eritrea claimed Thursday it had killed more than 200 Ethiopian troops and wounded more than 300. A Ministry of Information statement did not say how many Eritrean troops were killed or wounded. There has been no independent confirmation of the figures released by Eritrea in a government statement Thursday. In an interview with VOA's Horn of Africa Service, Ethiopia's Communications Minister Getachew Reda suggested the figures are inaccurate but stopped short of denying them. He also said Ethiopia has no interest in disclosing its assessment of damages during the battle. Reda added that "active hostilities ... launched by the regime in Asmara" were stopped, and Ethiopia was prepared to repel what it views as Eritrean hostilities. “What we do next will ultimately depend on what the regime in Asmara decides to do next,” Reda said. Awet Weldemichael, a professor of history at Queen’s University in Kingston, Canada, said despite the fact that these clashes were dismissed by some as “skirmishes” similar to others that have periodically flared up, they were quite serious. FILE - A general view shows buildings in the central business district of Eritrea's capital Asmara, Feb. 16, 2016. “These involved heavy bombardment using medium- and long-range artillery weapons and it went on both sides," Weldemichael said. "These were not mobile units or militia using their handguns or light weapons. So that makes it different in scale which means that there are damages endured by either or both sides." He also said the Eritrean ministry statement issued Thursday that cited casualties must be viewed cautiously and skeptically since there is no independent media on the ground to corroborate it. U.S. State Department spokesman John Kirby issued a statement Tuesday stating that the U.S. is concerned about military action and called on both governments to “exercise restraint and engage in political dialogue,” referencing the 2000 Cessation of Hostilities Agreement. International observers said the June 12 clash between Eritrean and Ethiopian forces is just the latest of a long series of violent incidents that have erupted between the two nations over the past five years. Among those closely following the events is Cedric Barnes, the Nairobi-based Horn of Africa project director for the International Crisis Group. Since 2011, there have been eight confrontations along the militarized border, Barnes said. Some have directly involved the national militaries of the two countries, while others involve rebel groups supported by one side or the other. “Once it seems that this action has died down and various forces withdrawn maybe to their original positions it [reoccurs] nevertheless and shows how tense the border is, how vulnerable it is to flare ups,” Barnes said. He said that reliable information about the latest incident is difficult to come by with many of the accounts coming from people who are not on the ground. Tensions have heightened recently with Ethiopia threatening to take proportional military action if it saw a threat. “It is very difficult to say that what particularly precipitated this incident apart from the fact that the very presence and unresolved nature of that border means that the tensions can spill over very quickly,” Barnes said. He said that over the past several years Eritrea has become more confident in its international standing and better funded due to its participation in the Saudi-led coalition in Yemen, the United Arab Emirates use of Eritrea’s port of Assab and its engagement with the European Union. “Eritrea was really on the back foot, but now it feels a little bit more secure and Ethiopia is more concerned about the capacity of Eritrea to cause it trouble,” he said. However, Weldemichael, of Queen’s University, said the responsibility is now squarely on the governments of Ethiopia and Eritrea. The international community has lost years’ worth of opportunities to push both in the right direction, he said. "Whatever the reality on the ground, this is tragic. It’s going to be another tragedy of epic proportions for these two countries to go back to conflict however low intensity," Weldemichael said. "It’s high time that the international community gears up to address the root causes of this problem and compel the two countries to abide by international law and normalize relations,” he added.